Google "Tornado Alley"-- you typically get maps that are restricted to the US, such as the one at the left. 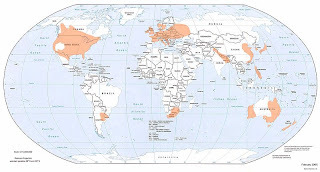 Do tornados start and stop at our borders? 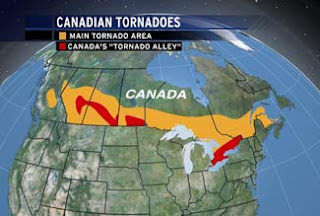 No, Tornado Alley does extend into Canada (right), and some tornados originate in northeastern Mexico; the storm that spawned the large Eagle Pass, TX, tornado in 2007 produced a tornado in Mexico before moving into the US. *Moisture for these storms originates in the Gulf of Mexico, and it is pulled northward where a trough of low pressure often sets up east of the Rockies in Alberta, Saskatchewan and Manitoba. The area of enhanced tornadoes in Ontario is enhanced by the flow of cool air from Lakes Huron, Erie and Ontario. Tornados in Canada may be under reported because of the low population density in places. On average, Canada has about 80 tornadoes per year compared to nearly 1300 in the US, and 2 deaths/year compared to the average of 62/year in the US. One F5 tornado occurred in Canada, the Elie, Manitoba, tornado of June 22, 2007. 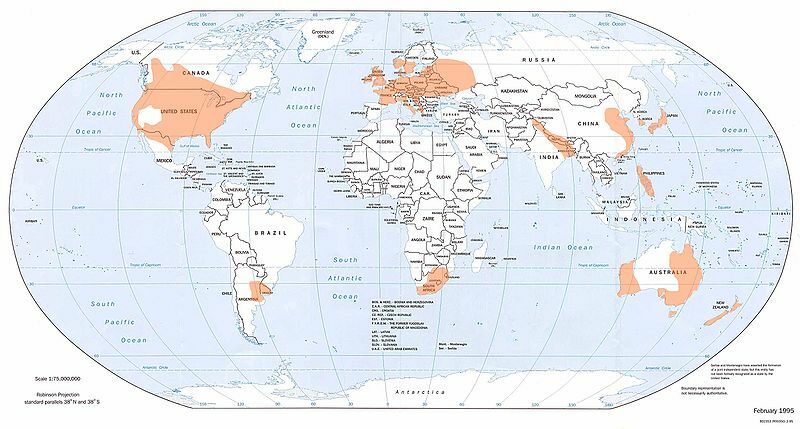 Although tornados are more frequent in the US than elsewhere in the world, they are not unique to the US. Photo by J. David Rogers, from here. The Colorado River winds its way for nearly 200 miles below Glen Canyon Dam through Marble Canyon and then the Grand Canyon. 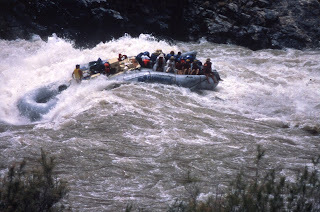 Along the way, nearly 100 rapids make rafting the Colorado one of the most exciting whitewater adventures in the world. Two of the rapids, Crystal and Lava Falls, are rated a 10 on a scale of 10. Crystal (photo) was formed in 1966 when a debris flow from the tributary, Crystal Creek, temporarily dammed the river. Discharges into the Grand Canyon have been regulated by Glen Canyon Dam since 1963, ranging between 5,000 and 30,000 cubic feet per second (cfs). These discharges sculpted the debris fan and widened the channel, but Crystal remained a difficult rapid for boating and was the site of many flips of rafts. In 1983 rapid snow melt from the Rocky Mountains forced engineers at the Dam to release extra water through the spillways and bypass tubes. Discharges ramped up to 90,000 cfs, and a huge wave developed at Crystal. Why Crystal and not the other rapids? Because the other rapids had, over geologic time scales of thousands of years, seen annual floods in excess of 100,000 cfs and had been sculpted to accommodate these discharges. Not so at Crystal because of the control of Glen Canyon Dam. The wave that developed was more than 15' high (see photo--the pontoons on the sides of the boat are 3' diameter for scale), and a boat, not as lucky as this one, flipped in the rapids. People were washed up to 15 miles downstream in the frigid waters and one person died. Another died in 1984 in a similar accident although the wave was not as big as pictured here. Kieffer, S.W., 1985, The 1983 hydraulic jump in Crystal Rapid: Implications for river-running and geomorphic evolution in the Grand Canyon: Journal of Geology, v. 93, p. 385–406. Well, fortunately, this is 2011. And, yours truly is off to go rafting!! There's no communication with the outside world once we launch on the river, so, folks, "adios" until mid-May!! Glen Canyon Dam / Lake Powell –The unregulated inflow to Lake Powell as of April 18, 2011 has been 545 kaf and the rate of inflow has increased to over 19,000 cfs. Since April 9, 2011 the elevation of Lake Powell has been increasing from what will likely be the low elevation for water year 2011 of 3609.7 feet above sea level. The official forecast for unregulated inflow to Lake Powell for April was 1100 kaf (112% of average). The daily average release rate from Glen Canyon Dam is about 15,500 cfs. The elevation of Lake Powell at midnight on April 18, 2011 was 3610.0 feet above sea level (90.0 feet from full pool). It is projected that the elevation of Lake Powell could increase by more than 30 feet to a peak elevation of approximately 3643 feet above sea level by late July or early August. 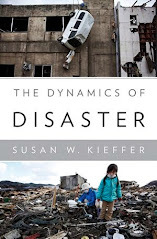 The release volume currently scheduled for April is 940 kaf. Average daily releases were reduced to approximately 15,500 cfs steady on April 11, 2011 in response to updated capacity estimates for the generating units at Glen Canyon Dam. The reduced elevation of Lake Powell has mad the generating units less efficient which has reduced generation capacity. In order to maintain a sufficient level of available capacity for reserves and regulation (see description in following paragraph), it was necessary to reduce the release rate from Glen Canyon Dam. In early May, releases will likely be steady at about 15,000 cfs for the first 13 days of the month. On May 14, 2011 it is projected that Units 3 and 4 will be returned to service and when this occurs, releases from Glen Canyon Dam will be increased such that daily peak releases will be about 22,000 cfs and off peak releases will be about 16,000 cfs. The projected release volume for May is approximately 1.10 maf. In addition to daily operations that may or may not include daily fluctuation patterns for load following power generation, the instantaneous releases from Glen Canyon Dam may also fluctuate somewhat to provide approximately 40 megawatts of system regulation. These instantaneous release adjustments maintain stable conditions within the electrical generation and transmission system and result in momentary release fluctuations within a range of about 1100 cfs above or below the targeted hourly release rate. The momentary fluctuations for regulation are very short lived and typically balance out over the hour. Spinning and non-spinning reserve generation is also maintained at Glen Canyon Dam. In order for Glen Canyon Dam (and other Colorado River Storage Project dams) to participate in the electrical generation and transmissions system, Glen Canyon Dam must provide a level of reserve generation to assist the local control area to maintain electical supply when unanticipated generation unit outages occur within the control area. Glen Canyon is required to maintain 99 megawatts (approximately 2,650 cfs of release) of capacity in reserve for these unanticipated outages. When an electrical outage occurs, Glen Canyon Dam can be called upon to provide up to an additional 99 megawatts of generation above what was originally scheduled for Glen Canyon Dam for a duration of 2 hours or less. Under normal circumstances, calls for reserve generation occur fairly infrequently and are for much less than the required 99 megawatts.